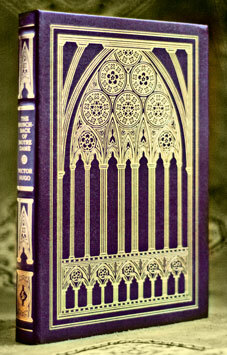 Publisher: The Easton Press, 2003, Collector’s Edition, From the 100 Greatest Books Ever Written series. Condition: Hardcover, deep red leather. Very good, with slight amount of shelf-wear. Massive book, will cost extra to ship overseas. The story dates back to Epiphany (6 January), 1482 in Paris, France, the day of the ‘Feast of Fools’ in Paris. Quasimodo, the deformed bell-ringer of Notre Dame, is introduced by his crowning as Pope of Fools. Esmeralda, a beautiful Gypsy with a kind and generous heart, captures the hearts of many men, including that of a Captain Phoebus, but especially those of Quasimodo and his adoptive father, Claude Frollo, the Archdeacon of Notre Dame. Frollo is torn between his lust and the rules of the church. 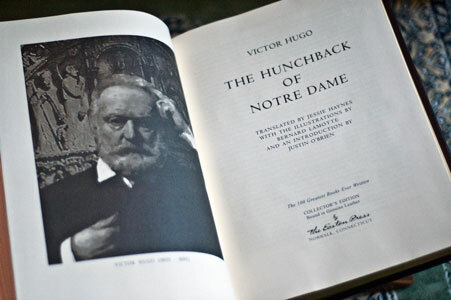 He orders Quasimodo to kidnap her, but the hunchback is suddenly captured by Phoebus and his guards who save Esmeralda. Quasimodo is sentenced to be whipped and tied down in the heat. Esmeralda, seeing his thirst, offers him water. It saves him, and she captures his heart. Esmeralda is later charged with the attempted murder of Phoebus, whom Frollo attempted to kill in jealousy, and is sentenced to death by hanging. 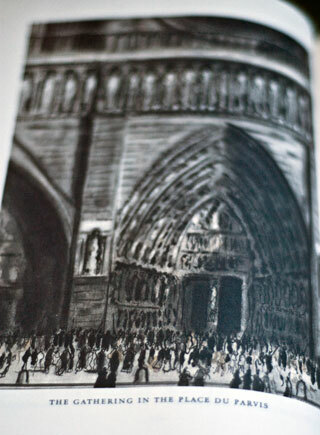 As she is being led to the gallows, Quasimodo swings down by the bell rope of Notre Dame and carries her off to the cathedral under the law of sanctuary. Clopin, a street performer, rallies the Truands (criminals of Paris) to charge the cathedral and rescue Esmeralda. The King, seeing the chaos, vetoes the law of sanctuary and commands his troops to take Esmeralda out and kill her. When Quasimodo sees the Truands, he assumes they are there to hurt Esmeralda, so he drives them off. Frollo betrays Esmeralda by handing her to the troops and watches while she is hanged. 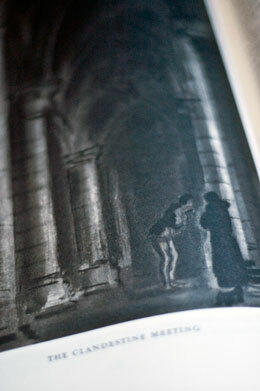 Quasimodo pushes him from the heights of Notre Dame to his death. Quasimodo then goes to a mass grave, lies next to her corpse, crawls off to Esmeraldas tomb with his arms around her body and eventually dies of starvation. Two years later, when their grave is excavated, Quasimodo is found embracing Esmeralda, whose neck is broken. As someone tries to separate the two, Quasimodo’s bones turn to dust. 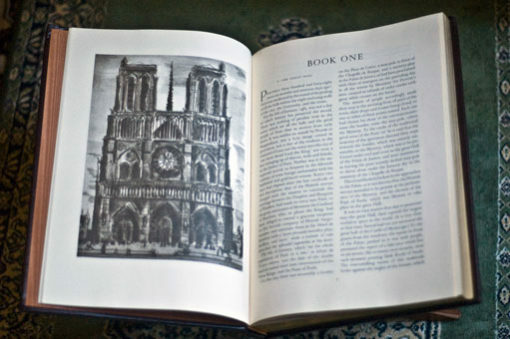 The enormous popularity of the book in France spurred the nascent historical preservation movement in that country and strongly encouraged Gothic revival architecture. Ultimately it led to major renovations at Notre-Dame in the 19th century led by Eugène Viollet-le-Duc. Much of the cathedral’s present appearance is a result of this renovation.